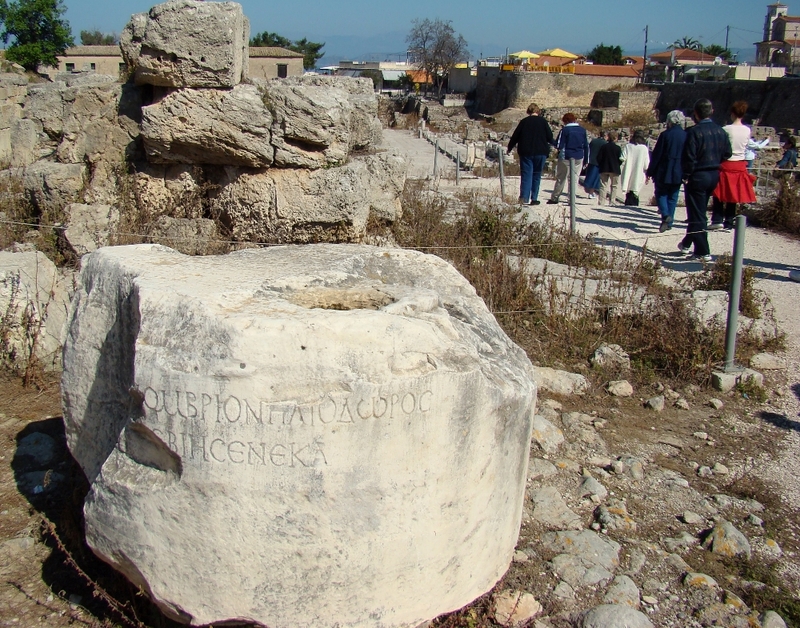 Among the ruins visible today as one visits biblical Corinth, is a portion of a column bearing the name of Seneca. Column fragment at Corinth with Seneca’s name (Latin CENEKA). Photo by Leon Mauldin. Seneca is of interest to students of Acts, because he is the brother of the Proconsul Gallio, before whom Paul stood trial at Corinth (Acts 18:12-17). Usually when Paul was brought before rulers for his gospel teaching he was promptly beaten and often imprisoned (2 Cor. 11:23-27). However here at Corinth Gallio could see that Paul was not a law-breaker, and threw the case out. Lucius Annaeus Seneca (often known simply as Seneca /ˈsɛnɪkə/; c. 4 BC – AD 65) was a Roman Stoic philosopher, statesman, dramatist, and in one work humorist, of the Silver Age of Latin literature. He was a tutor and later advisor to emperor Nero. While he was forced to commit suicide for alleged complicity in the Pisonian conspiracy to assassinate Nero, he may have been innocent. His father was Seneca the Elder, his elder brother was Lucius Junius Gallio Annaeanus, called Gallio in the Bible, and his nephew was the poet Lucan. The mention of Gallio in the text (Acts 18) is helpful in dating the events at that point in the ministry of Paul. Gallio was the proconsul [Grk. anthupatos] of the Roman senatorial province of Achaia (Acts 18:12). Proconsuls generally served two-year terms, and such appointments offered potentially great financial rewards. Achaia’s administrative center was Corinth, a newly rebuilt city at the time and a busy commercial and transport center. The city had as many as 200,000 residents, and the province of Achaia may have had several million subjects. . .
An inscription at the Temple of Apollo in Delphi indicates that Gallio’s time in Corinth may be dated to AD 51–53. Thus, Paul’s appearance before Gallio probably occurred in the spring or summer of AD 51. (The Lexham Bible Dictionary). Gallio’s younger brother, Seneca, was a philosopher, and apparently an inflammatory one. In AD 41, Emperor Claudius exiled this young thinker to the isle of Corsica. Usually, such disgrace tarnished the entire family. Whatever political ambitions Gallio may have had were effectively derailed by his brainy brother’s banishment. But in AD 49, Seneca was ushered back to Rome with a grand purpose: he was placed in the imperial court as the tutor to Claudius’ nephew and royal successor, a young, impetuous Roman named Nero. Undoubtedly, it was at this time that Seneca was instrumental in helping to secure a political post of proconsul for his older brother, Gallio. That article may be read in its entirety by clicking here. I have several posts on biblical Corinth, with photos and brief articles. Use search box at upper right. This entry was posted on Thursday, February 12th, 2015 at 1:08 PM and is filed under Bible History and Geography, Biblical Interpretation, Corinth, Greece, New Testament, photography, Travel. You can follow any responses to this entry through the RSS 2.0 feed. You can leave a response, or trackback from your own site.